Despite what you might think, the horrors of festivals and annual events that condone animal cruelty are not just a foreign problem. Sure, the disgusting Yulin Dog Festival in China, the archaic Running of the Bulls in Spain and the dolphin and whale slaughters in Japan and Iceland are much more notorious. But here in the United States, there is a festival that rivals the brutality of any of those events and no one seems to bat an eye. Every year, the population of Sweetwater, Texas explodes when around 40,000 visitors set upon it for just one weekend in March. The big draw? The annual Rattlesnake Roundup. The event is advertised as good old family fun, but in reality it is two days of blood, guts, slaughter and a display of animal abuse so egregious that it defies belief. 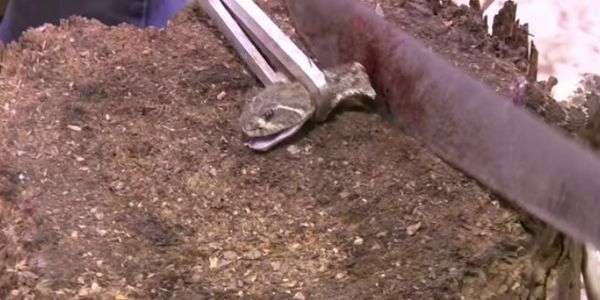 Here, thousands of snakes are rounded up from the surrounding countryside and then thrown in huge pits where they await their fate — a gruesome death. For a $60 weekend pass, visitors get access to all the disgusting action. There, the spectators can take part in the macabre events. There's the Miss Snake Charmer pageant where young teenage beauty queens get their hands dirty as they take turns decapitating helpless snakes. There's the bloody mural that serves as a backdrop to the massacre, covered with bloody handprints from kids and others who pay a small fee to try their hand at skinning a recently killed snake. Then, they slap their hands against the mural to mark their accomplishments. This happens to thousands of snakes throughout the two-day event. And it is completely condoned by city, state and federal officials even when there are rules about animal cruelty on the books. If these were dogs in China people would be outraged, but because snakes aren't cute and cuddly this festival has been allowed to commit barbaric acts of cruelty for nearly 60 years with hardly any pushback. All living things deserve respect and the chance to live freely, that includes snakes. If you are outraged by the Yulin Dog Festival or the Taiji dolphin slaughter you should also be outraged by what goes on every March in Sweetwater, Texas. This event is a stain on the face of America and goes against the principles with which we hope others around the world will follow when it comes to the treatment of animals. It's time festivals like this that celebrate and profit from animal slaughter go the way of the dodo bird. They don't belong anywhere but they most certainly shouldn't take place here in the U.S. Please sign the petition and demand the end of the Sweetwater Rattlesnake Roundup. We must fight animal cruelty no matter where it is, and that includes our own backyard.